Current version: 1.1.5 (changelog).Create a modern movie blog for watching online & downloading on Blogger. We're so confident that you’ll be satisfied with this movie site maker script that we're giving you a Risk Free full 30 days to check it out, but for some subtle reasons, please try our FREE trial movie site maker service for UNLIMITED features first; if then for any reason you’re not satisfied just email back and we’ll refund every penny, Guaranteed! Build your movie/anime/cartoon/video networks on Blogger platform, you'll never worry about the server issue, bandwidth, load balance, etc. All server issues are guaranteed by Google with powerful Blogger. We help you install the completed Blog & script to use, you'll not to setup anything, only need to focus on updating movies/videos. 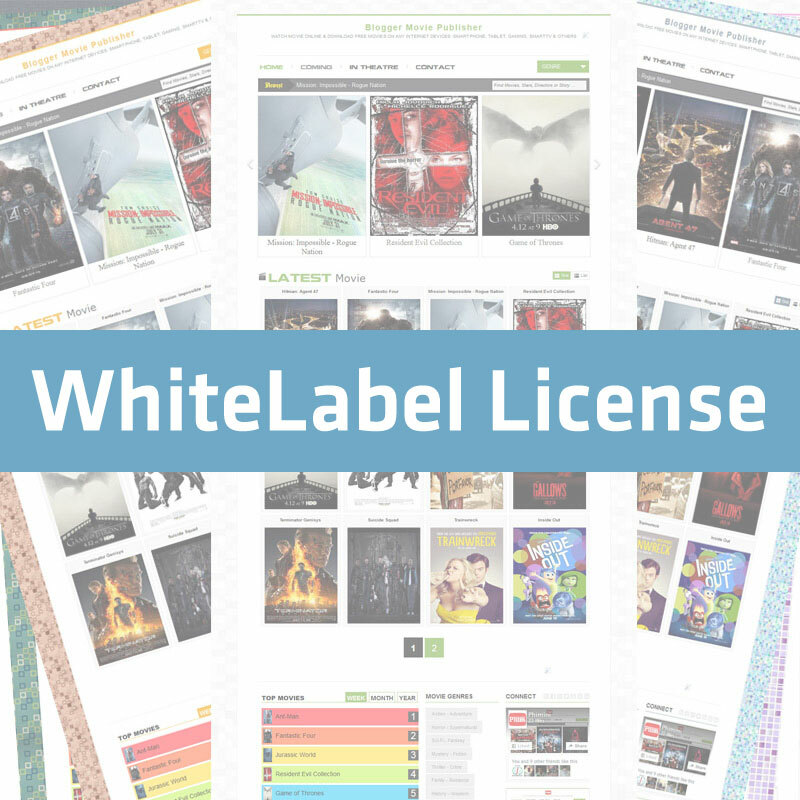 You're admin, allow members to publish unlimited movies to your blogs, members are free to edit/update their movies. Help you obtain movie information rapidly, such as title, info, poster & media resources. Support & Convert your movie blogs & admin panel to other languages easily & quickly with language plain-text files. Both admin panel & movie blogs work on any device, any platform, just with a browser with a same experiment; such as smartphone, tablet, gaming devices, smartTV, internet TV. Support 7 pre-made responsive mobile color styles and easy add & apply more Blogger templates as you wish. Helpful tool to update your hot movies / videos daily without touching anything. Super easy to add popular movie sources quickly: Youtube, Dailymotion, Vimeo, Facebook, Google Drive, Flickr, Veoh, Blip, Netflix, Hulu, Metacafe. Support 2 advertise placements to generate more revenue easy & quickly, certainly you may add more placements because of Blogger platform. Support many famous social sharing solutions: AddThis, Feedburner, Like2Reveal to share movie on Facebook, Google+, Twitter, LinkedIn, Pinterest & others. Receive visitor's messages directly into your inbox, or just get noticed about movie problems. Every 15 minutes (you may change it), a popunder appears to force your visitors like fanpage to keep watching movie, a great way to boost your Facebook presence. Top Popular Movies listings are cool way to keep your visitors stay longer on site, to have more potential revenue. Just apply a class to BODY tag for changing the movie blog to new color style. Just a tiny but very helpful feature to make your movie blogs becomes friendly. Many stunning & amazing UX animations integrated into movie blog to make it more beautiful & appealing. Just with an Internet-contected device, with any platform & any screen size flawlessly with same UI & UX. We're developing & adding new features frequently, so your movie blogs can not be out of date. Host this movie site maker script yourself on live host to build the video empires quickly & easy. Super Easy Installation, just require an email & MySQL database to install. Membership Management: your members may publish UNLIMITED movies to your Blogger blogs. Mobile Friendly UI & Responsive layout, with 7 pre-made color styles: Green Tea, Blue Soda, Red Waterlemon Juice, Iced-milk Coffee, Orange Honey Tea, Purple Grape Wine & Pink Strawberry Cocktail. Movie blogs work on any device, any platform & any screen size flawlessly. 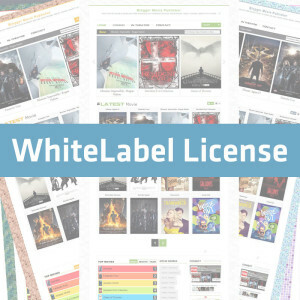 Be the first to review “Blogger Movie Publisher: WhiteLabel License” Click here to cancel reply.